Eleanor Brice Desmarais, she of the cracked glass slipper and unladylike intellectual propensities, has learned that happily-ever-after is as rare as a frozen dragon, even for a happenstance princess. She survived a plot against her life, but her marriage to the alcoholic, womanizing Prince Gregory of Cartheigh remains at best a sham, and at worse, a potential noose around her neck. Eleanor understands the harsh realities of women’s lives in her kingdom, so she turns her energies to a school for impoverished girls. She hopes to give them new opportunities, but the temptations of the streets and an ominous plot to bring down the witches of Afar Creek Abbey threaten to close the school forever. She finds joy in stolen hours with her lover, Dorian Finley, but her husband’s increasing suspicions, her stepsister’s continued scheming, and her own conscience create a rift between Eleanor and Dorian that seems insurmountable. A witch’s spell and a beautiful necklace are all that stand between Eleanor and a most permanent, and dangerous, heartbreak. 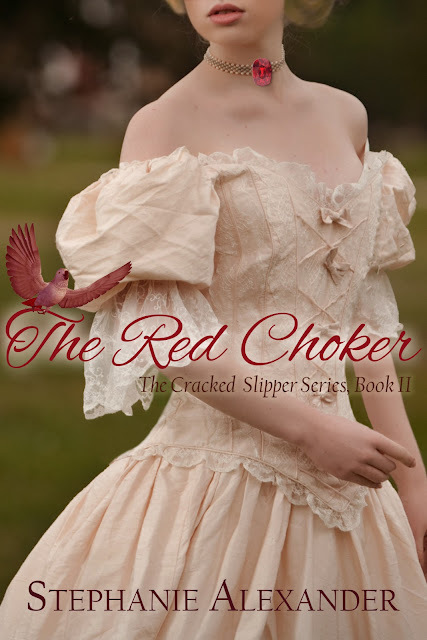 The Red Choker is the sequel to Stephanie Alexander’s bestselling debut novel, The Cracked Slipper. Last year I reviewed Stephanie Alexander's debut, The Cracked Slipper, and was amazed by its strong heroine and fantastic plot. The sequel to that enchanting novel, The Red Choker, will be available this Friday, March 8. That's just two days away so mark your calendars! In addition to the reveal of this stunning, magnificent and just simply amazing cover, I'm hosting a giveaway! (Please, don't hold your applause) One winner will be gifted a copy of The Red Choker from Amazon. The giveaway will be open for exactly one week (3/6 - 3/12), so enter quickly. Please be sure to use a valid email. The winner will have 24 hours to respond to email notification.